A distinctive aspect of the city centre in Chester is the Chester Rows, with half-timbered galleries, accessed via steps, forming a second row of shops above those at street level. A feature of the streets radiating from Chester Cross, they are found in Watergate, Eastgate and Northgate Streets and in Upper Bridge Street. Though their origins of the Rows are subject to debate, it is thought that they date from at least the 13th century. 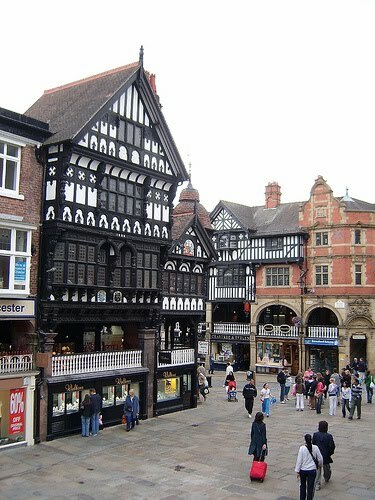 A number of suggestions about how they came to be exist, with some believing that as Chester's Roman buildings slowly crumbled, medieval traders built their shops along the top of this debris accessed by a path or steps from the roadside, with subsequent alterations seeing stalls spring up along the road to display goods. Another suggestion is that the constructions were designed to help prevent a repeat of a fire that all but destroyed the city in 1278. Whatever their origins they are an interesting feature of Chester.